Properties in Dominican Republic average 4.5 out of 5 stars. Property 16: SOSUA RELAXX AND LUXURY at 86 degrees all year round! 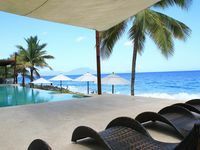 Property 17: Brand New Luxury Villa Sosua/Cabarete ,w/private pool. Property 22: BEACHFRONT LUXURY CONDO W/POOL. STEP OUT TO WHITE SAND PRIVATE BEACH. Property 35: A Few Steps From The Gorgeous Beach Of Punta Rucia! Property 38: Do Anything Or Do Nothing!! The View Is Spectacular. Just spent five nights. Infinity Blu is a wonderful compound in Sosua; unusually well-maintained, nice staff. The unit is the furthest from water and closest to the street -- but it's still set back from it. I think the location is built into the price, and it's just a 3 minute walk to the image you seen in the unit advertisement -- it really is as gorgeous as it looks here -- so no big deal. (Also, there isn't a beach, but there is easy access to the ocean for swimming and I saw someone on the staff help a resident bring the facility's kayak into the ocean for some sunset paddling.) I understand it's pretty empty in the off-season, as it was for most of my stay. Enrique was punctual meeting me arriving and leaving. I only used the fan and no a/c, TV, etc. so the electric bill for the entire time I was there was $6. Something I really appreciated was the large bottle of water w. the pump for drinking. You really can just show up and don't need to worry about anything. I hope to be able to visit again.